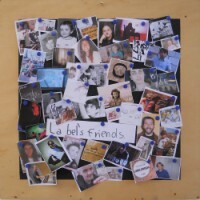 Italian netlabel, La Bel is only couple of years old but it’s introducing great new talent to the world of indie folk music. Officially started March 2010, the label has grown quite a bit since they started. They’ve become a great platform for experimental musicians who have a knack for mixing the eclectic and the melodic. One of the the primary things that sets apart the compilation is the amount of variety it provides yet while sticking under one umbrella of music. From instrumental folk to electronic lofi to sweet indie pop, you’ll find quite a few low-key indie tracks that are perfect for some quiet morning tea or coffee. Starting the mellow tirade is, Greek Tragedy, from Adam Radmall also known as Plusplus. His brand of acoustic instrumental folk is beautiful and intense. So far, he has released several albums since 1999 and continues to work on new material until now. Meanwhile, Laura Mura & the Seven Dwarves, adds a touch of whimsy girly folk to the mix with their track Smeraldo clean da house. It’s a personal favorite from the record and features gorgeous Joanna Newsom folkish style to the blend. Tschuss my Dear from Neeva, on the other hand, sounds off an electro ambient and dark atmosphere to the record. It’s purely instrumental and moody, equivalent to walking through a dark, dense forest during sunset. Overall, you’ll find plenty of interesting tracks in this compilation. Whether you’re in for some quiet folk or maybe long for a bit more atmospheric dark ambient sounds, its’ all packaged right here. Grab the free download and make sure to check out La Bel’s other artists as well.